Susie Wolff will stay at the Williams team next season in an enhanced role as test driver. The 31-year-old Scot was development driver this year but her position will be expanded in 2015 to include two runs in Friday practice and two tests. The move comes after Wolff impressed in an outing in free practice at the German Grand Prix this year. 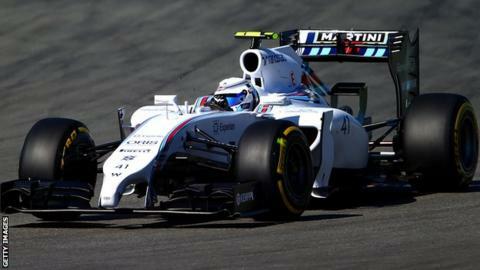 "I'm really happy to be able to carry on and get more time in the car," Wolff told BBC Sport. "That was the most important aspect. "This is another step in the right direction for me. I am delighted Williams are recognising my progression, hard work and that it is performance that counts. "I'm incredibly proud of what the team have achieved this year and I hope we can continue that development next year." Williams have finished third in the constructors' championship this season, a year after suffering the worst season in their history, following a major internal restructuring and a switch from Renault to Mercedes engines. This year, Wolff did a day's test in Barcelona in May, before two planned outings in free practice at the British and German races. Her outing at Silverstone ended after less than a lap when her car suffered engine failure. But at Hockenheim she completed a full session and ended up with a time just 0.227 seconds slower than race driver Felipe Massa, an 11-time grand prix winner. Williams's reserve driver Felipe Nasrhas moved to race for Sauber in 2015. It is not clear whether Williams will replace him, but Wolff is in any case expected to be the prime driver for the team at tests other than the race drivers Massa and Valtteri Bottas. Williams deputy team principal Claire Williams added: "Susie continues to impress us with her strong technical knowledge, the feedback she delivers and the performance when she drives the car both on the track and in the simulator. "She has steadily increased her time behind the wheel since she joined us in April 2012 and her appointment as test driver was a natural progression."